Our own Victoria Ipri was interviewed by Business Insider as an Expert on How to Get More out of Linkedin, the business social media network. "I think we're going to see in 2012 people engaging in the platform the way it's supposed to be. The power isn't the profile, it's the people," Ipri said. "I think there's so much emphasis on creating a dynamic profile that people forget LinkedIn is about outreach. It's about sharing information, viewpoints and becoming a thought leader in your own community." Victoria and I spoke after she appeared in the Business Insider, and we chatted about her recent LinkedIn seminar that she presented at the exclusive What's Next Conference in Washington D.C.
Victoria was surprised at the growth in interest from the business community in learning how to use LinkedIn. Her seminar was filled to capacity, and more. Many know that they "should be on" LinkedIn because everyone else they know has a profile, but they don't know what to do after that, Victoria noted. But, she says that the secret to get more of LinkedIn is straightforward. 1. Present yourself as a problem solver - what are type of problems you can solve that other people need help with. Don't make your profile a simple resume, highlight the types of probles you can solve. 2. Look for other problem solvers to help you. 3. Finally, pick up the phone and call that someone - now that you know what they can do for you, or what you can do for them. What LinkedIn does it makes a cold call just a bit warmer because you know something about who you are phoning, and they know something about why you are phoning. Nothing harder or easier than that. Of course it is not a secret that you sales are built on relationships, but LinkedIn gives you the ability to search for the problem solver you need. There are a couple of tricks in using the platform, and I want to pass one along. 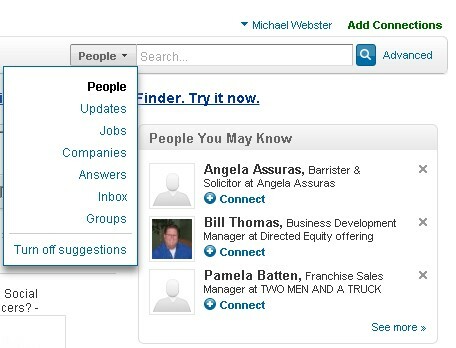 Belonging to LinkedIn groups is important, and you can use keywords to search for a group. I am going to use the keyword "negotiation" for this example. Click on the little triangle, beside "People", and you will get a drop down menu. 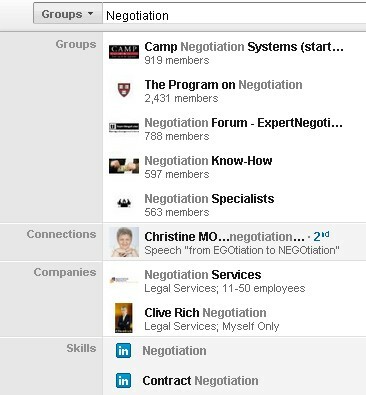 We are going to select "Groups", right at the bottom and then type in "Negotiation" to search for groups of people talking about Negotiation. See how, when I type, LinkedIn shows me some relevant information. 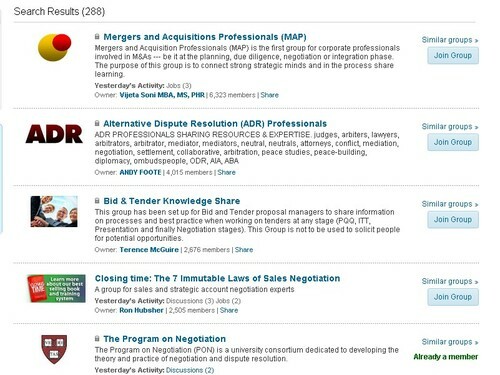 Finally, let's look at the groups in LinkedIn about negotiation. Wow, there are almost 300 groups. I belong to one of the top 5 groups. But, there are many more worth my looking into if I was searching for a specific area. 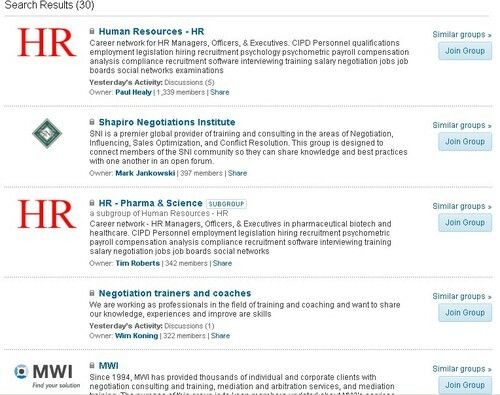 Let's narrow it down to "negotiation training". Now, I am down to a manageable 30 groups, and in the top 5 is another IAFD key partner, Mediation Works Inc. Very quickly, I am able find like minded problem solvers, join the group and find out more. Victoria stresses that joining up to 50 groups is a good strategy if you are in a heavy network building phase. Once your network is growing satisfactorily, being effective in this many groups is impossible. She suggests choosing 8-10 groups and really making your mark in those. As well, a monthly or quarterly pruning of groups can bring fresh blood to your marketing efforts. Good luck and do get Victoria's book. Your copy is free when you join the group, Link InSanity. Victoria Ipri is a respected LinkedIn evangelist and the author of eBook "LinkedIn for the Clueless," Ipri established her reputation as a LinkedIn expert by getting out there, sharing valuable information with others and getting to know people, which she says is the "secret" to how people really conduct business, since we want to do business with those we know, like and trust. Victoria has a free copy LinkedIn for the Clueless available to all registered newsletter subscribers to the IAFD. .